Vow Renewal at Trunk Bay; Feb 14! The love couple who started it all! We are always excited about the Valentine’s Day Marriage Vow Renewal at Trunk Bay. If you are married, consider coming to Trunk Bay for this free celebration of love, led by St. John’s lovely Anne Marie Porter. We love this love event, because it is a St. John creation, and so clearly a product of the spirit of Love City at its best. This year, we decided to see how preparations were going, so we dropped by to see Kathy Dove, co-founder with Anne Marie of the event, at the Book-It VI office in the Lumberyard. That first year there were 72 couples. Surprise your partner. Suggest a trip to Trunk on Valentine’s Day. It is fun, free, relaxed and a beautiful way to reaffirm your love bond called marriage. 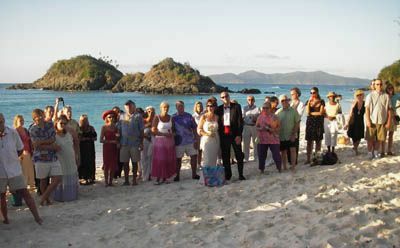 54 couples gathered on Trunk Bay beach to recite their vows to each other on Valentine’s Day. Fifty-four couples, representing a total of 1,116 years of marriage, dipped their toes into the sand and surf at Trunk Bay in a Tuesday afternoon, Feb. 14, vow renewal ceremony. The fourth annual ceremony attracted couples who had been married for anywhere from five hours to 57 years. The ceremony evolved through a brainstorming session between Porter and Cathy Dove, who approached Porter four years ago about performing a vow renewal ceremony for her and her husband Bill’s 30-year anniversary. Porter credits the Doves for bringing the ceremony to the community. “It was really due to the generosity of Cathy and Bill Dove, and their commitment to their relationship, as well as relationships in the community,” she said. The vow renewal ceremony has been attracting more tourists every year, said Dove. Steve and Patty Meredith, who were visiting St. John for the first time, said they discovered the ceremony in a magazine. The couple was staying on St. Thomas, but came to St. John for the ceremony, to celebrate their one-year anniversary. Porter said that the meaningful experience she provides for couples makes the time, money and energy she puts into the ceremony worthwhile. Dove, who spent time talking with the couples before and after the ceremony, said she encountered quite a few memorable people, from all walks of life. Another couple, who were married on St. John two years ago, came back for this year’s ceremony with a new addition—a baby. “She had just found out she was pregnant when she was here the last time,” said Dove. Another couple, who have been married for 20 years, brought their teenage daughters to the ceremony. Many couples at the ceremony had participated in the ceremony in previous years, and some had even been married by Porter. There were quite a few couples there that I had married, she said. One was Nancy and Mark Shekelton. We have a lot of couples who come to the ceremony year after year, she added. 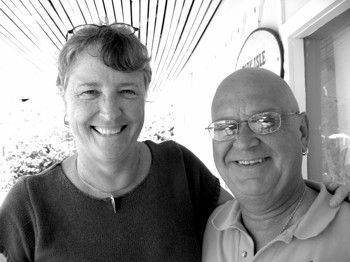 St. John residents Chuck and Terry Pishko, who have been married for 24 years, have participated in the ceremony for the past three years. It’s kind of fun, said Chuck. It gives you a nice feeling. The vow renewal ceremony benefits the community, as well as the couples who attend, said Porter.